Alexandre Vinokourov plans to fight off allegations that he bought his Liège-Bastogne-Liège win last year in Belgium. A Swiss newspaper published an article yesterday alleging the Kazakh cyclist paid €100,000 (£85,892) to Alexandr Kolobnev to ease off in the finale of the Ardennes Classic. 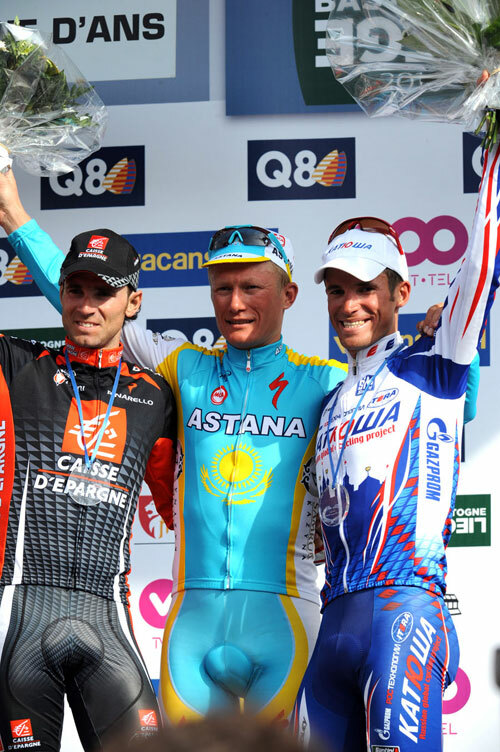 Team Astana, which Vinokourov started in 2006, plans to wait before taking any action. Martinelli said that it is a “huge sum” of money being report and that Vinokourov never said anything about a payment. They are at a team camp in Calpe, Spain, from December 1 to Saturday, December 10. Vinokourov already sent out a warning shot two days ago from Calpe, threatening L’Illustré journalist Arnaud Bédat, calling his work “gutter press” and saying that his e-mail account had been hacked. L’Illustré is a French-speaking newspaper based in Lausanne and has a circulation of 90,000. It published an article yesterday titled Le Prix de la Victoire (“The Price of Victory”) that contained several e-mails written in Russian between the two cyclists starting the day after the race. On April 25, Vinokourov safely rode clear with Kolobnev after the Roche aux Faucons climb and left his rival behind with one kilometre to race, on the climb to Ans. The next day, the e-mails started according to the newspaper. Vinokourov was caught blood doping at the 2007 Tour de France. He served a suspension and returned. Liège-Bastogne-Liège and a Tour stage win were his biggest comeback wins, but he plans to push for more next year, racing to the London Olympics. L’Illustré reports that the money was sent from bank BNP Monaco to BSI Locarno. Kolobnev is currently waiting on the Court of Arbitration for Sport (CAS) to hear a case between the UCI and the Russian federation. His federation let him off relatively lightly (fine of £1,063 or 1500CHF, and a warning) for failing a drug test for hydrochlorothiazide, a prohibited diuretic, at Tour de France this year. As with L’Illustré, CAS also bases itself in Lausanne. Vinokourov said in his e-mail today that the article could be politically motivated, appearing ahead of his countries elections. He did not respond to questions from Cycling Weekly for this article.